I know that this bow has been reviewed so many times, and for good reason. I have the 2015 model of the grizzly and I felt that being a new member I should type a review anyways even if it is beating a dead horse. The Grizzly that I have is 58" 55lbs at 28" draw, meaning at my dwarf draw of 26 inches we are working with about 50 pounds. The bow is beautiful. I think I could end the review there.. At least the grain pattern on mine is one that I really like. The riser is a solid piece of what Bear dubs future wood. In short future wood is a process of filling the natural woods pores making it stronger and heavier without sacrificing the nature grain of the wood. You can read more about it here. The Grizzly is a classic in the archery field and as such it has a classic look. Maple limbs under black glass...... not sure it gets more classic than that. The grip is a mid wrist mid size and perfect for even my short little fingers to get ahold of. (bigger hands might suffer). It is long enough to get good consistent shots with but also short enough to not be a hassle in the woods. I am not sure that there is a bow that stacks at 26" but I have heard reports of people with draws as long as 29.5" not having any stacking problems. 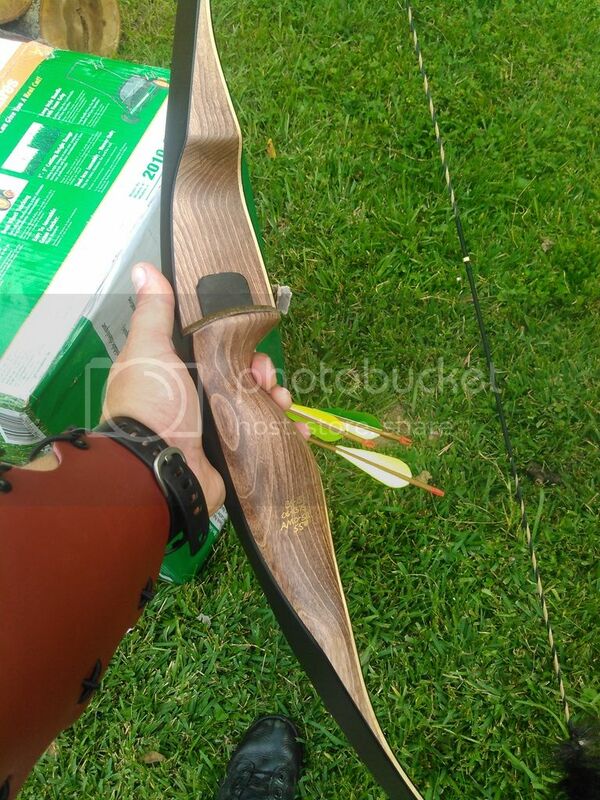 One of the first things that I noticed upon shooting the bow is how quiet it is. I mean even with out string silencers it is a whisper. This is actually a surprise to me because of how light the bow is. The rest that comes with the bow is perfectly sufficient. I have probably a thousand plus shots through the bow, because I am shooting every waking moment I have.....except while I am writing this review. I have a second rest just in case this one wears out but it doesn't seem like it will anytime soon. Not that speed is the most important thing in archery... We are all shooting trad bows here. The grizzly throws an almost 450 grain arrow at an average of 182 FPS and again that is at my 26" stubby draw at 50lbs. So in my opinion this is pretty respectable. 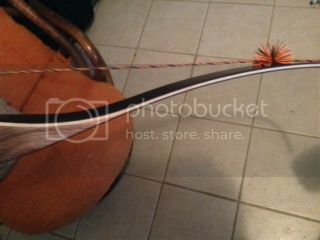 The bow is impressive in that it comes from 30lbs to 60 in RH and 35 to 55 in LH, which means there is a grizzly for pretty much anyone interested in getting into trad. There is a reason this bow has been reviewed a million times, and a reason its design has not changed since 1964. This kind of quality is also why you see these bows in the field 50 + years later. The grizzly's of a few years ago had a lot more reddish hue to the riser which I found infinitely more beautiful than the light brown of todays bow. I had heard rumor that perhaps the Dimond wood factory burned down and maybe that had something to do with the change of look. So I wish they would do something to bring it back to that beautiful red hue. It is not really a bad thing per say but the grizzly is one of only two bear bow that is not fast flight string compatible. Deacon B50 or B55 must be used. Though they are painted over the tips are reinforced with I believe the same wood as the riser, but not with extra fiberglass. In my opinion this little upgrade would go a long way, but it would involve changing a bow that has not really been changed since Fred Bear did himself in 1964. Perhaps the only thing that I find absolutely horrid about the grizzly is the string that comes on it. In fact I would rather the thing not come with a string at all if they are looking to save money and keep cost down. With all the energy that Bear puts into keeping the Grizzly great, this is a slack job and needs to be fixed. 20 dollars is all a quality string cost..... That is it 20 bucks I would even be in favor of paying 20 dollars more to get something decent. I have no idea what kind of string it is because it is not a proper flemish twist and does not have defined loops at each end. They just twist tighter and tighter. Super Grizzly. For a hundred dollars more you can get a fast flight "grizzly" so to speak. The super grizzly also boast double core of maple in the limbs, which bear says makes for a smoother draw. Having shot the two back to back for me it was not worth the other hundred. One I didn't like the black riser and call me shallow but I will only buy the bows I like to look at as well as shoot. I could not notice the different in the draw whether one was smoother or not. If you are wanting a similarly priced bow and want the fast flight string the Montana long bow certainly has it and is a beautiful shooting bow. The Grizzly has over 60 years in continuous production and more than 50 years unchanged. It is basically on every google list of the top ten recurves. You will be hard pressed to find a better value for the money and as such the Bear Grizzly is described as the working mans bow..... 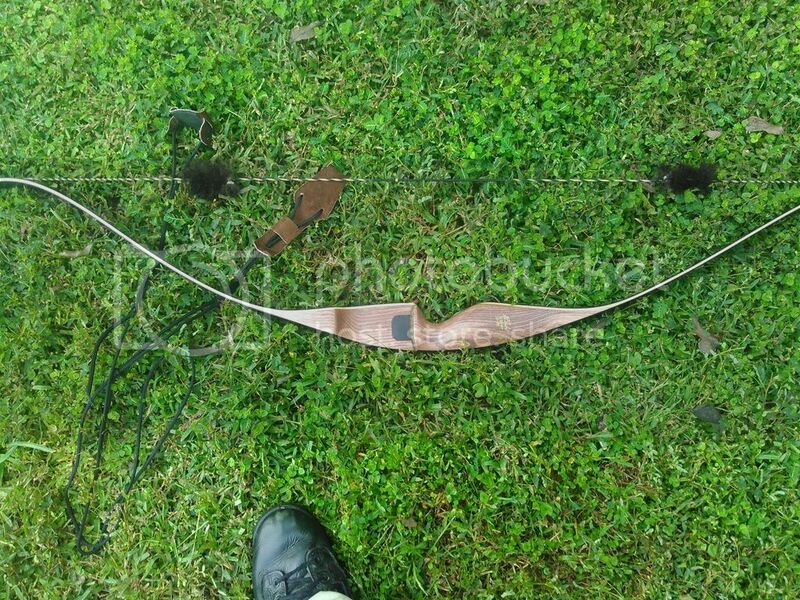 I would say this bow while a little on the pricey side for a beginner, would be a great bow to start on or get back into archery like myself.... HECK I also think it would be a great bow for anyone looking for a bow to take into the woods... What i mean is a bow that is going to work as hard as you are, not afraid of getting a little beat up on the trail, and not going to mess up the pretty bow that stays at home on the wall... Perhaps it is the working mans bow after all. Please watch the making of a grizzly link below a great 5 min video and shows you how a grizzly is brought to life. Great review I just purchased a 2015 grizzly in 50lb it shoots great. I agree on the string, however I just had my archery shop re-serve it and it is fine now.